Baby, it’s cold outside. A summer cold snap calls for something with a little more substance than salad. Something saucy and meaty and noodley. 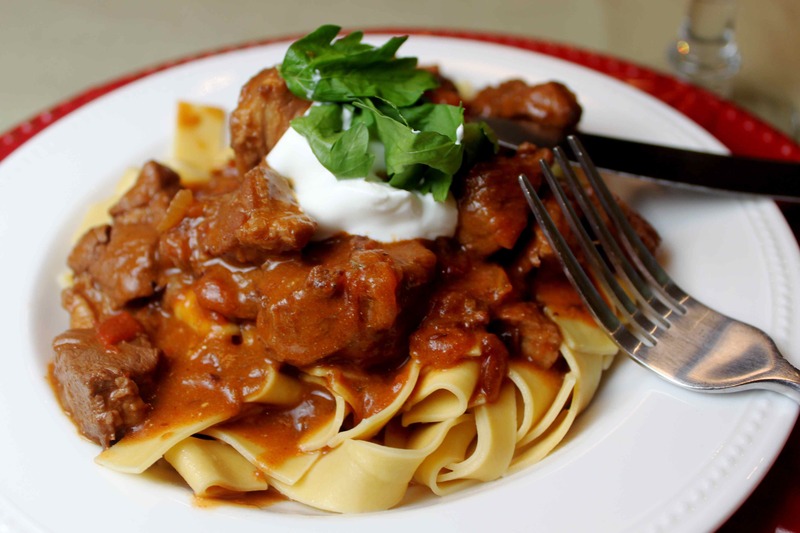 This paprikash fits the bill nicely; a rich, but not too rich, sauce made with red wine and fresh tomatoes and lots of heat from pungent Hungarian paprika and cayenne. Lean pork tenderloin is complemented by a good jolt of citrus that gives it a fresh, summery punch. I adapted this recipe from Olaf’s Kitchen by Chef Olaf Mertens, a used-book sale find I was suspicious of because it was in pristine condition (good used cookbooks tend to be splattered and stained). It was worth the $2 for this recipe alone. Mertens calls for veal tenderloin but I used pork. The only other substitution I made was a teaspoon of dried oregano for a tablespoon of fresh marjoram, which I was too lazy to go out and buy. As well, I may have used a tad more sour cream than the 1/4 cup Mertens called for, but who’s to know? Heat the oil in a large Dutch oven or pot over medium-high heat. Sear the pork, browning on all sides. Reduce heat to medium, add the onions and sauté until golden. Add the garlic and sauté just until you can smell the garlic. Season with salt and pepper. Add the flour, paprika, cayenne, caraway seeds and tomatoes. Add red wine and stir to thicken, cooking until liquid is reduced substantially (Mertens says by 80 per cent). Add the beef stock, bay leaf and oregano (if using fresh marjoram, wait to add with the zest) and reduce heat. Simmer for 45-60 minutes. Add the zest. Season with more salt and pepper to taste, remove from heat and stir in sour cream. Serve over egg noodles. Enjoy. This entry was posted in Main Courses, Meat and Poultry, Soups and Stews. Bookmark the permalink. Great! We’ll set another place.